Published: Dec. 30, 2018 at 07:22 p.m.
Los Angeles Chargers running back Austin Ekeler drives through contact on the 1-yard touchdown run. Published: Dec. 30, 2018 at 07:11 p.m. 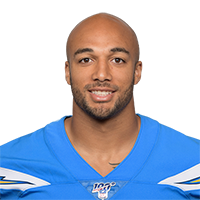 Published: Dec. 9, 2018 at 04:53 p.m.
Los Angeles Chargers running back Austin Ekeler bursts up the middle for a 5-yard rushing touchdown. Published: Nov. 25, 2018 at 06:29 p.m.
Los Angeles Chargers running back Austin Ekeler gets in between the tackles and powers into the end zone for a quick 2-yard touchdown.